Radius Track® has built their reputation by turning the most complex curved surface challenges into simple solutions. 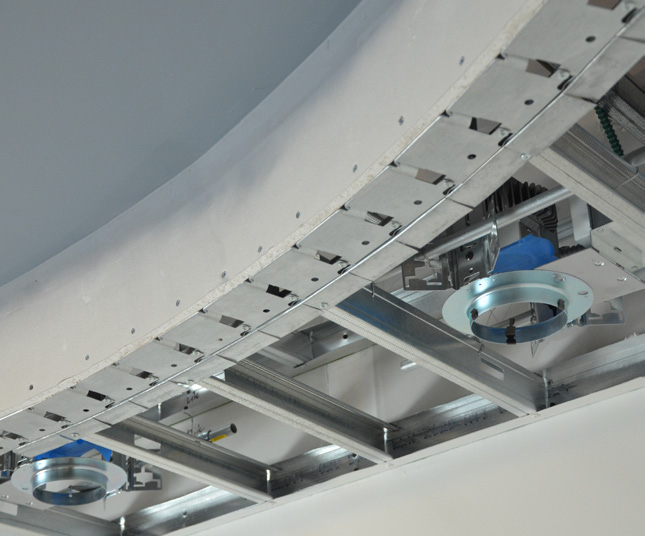 These Radius Track solutions can dramatically reduce costs without sacrificing aesthetic or structural objectives. Their cold-form steel fabricating service allows you to specify exactly what you need, and get it shipped right to your job site, ready for installation. As another option, Radius Track ‘Ready Products’ are supplied in straight sections that can be easily hand-formed to your exact requirements on site. Ready Products hold their shape so they’re simple to install, reducing labor costs. Their portable hand tools allow you to accurately replicate curved forms to save enormous amounts of installation time. Radius Track Bender® is ideal for forming curved studs and track runners up to 33mil and 6″ in width. The Radius Trim Bender® allows you to curve 33mil angle up to 3″ x 3″ for beautiful curves every time. CWallA is your source for Radius Track. Not all Radius Track products are available through CWallA. Check with your local representative for more information and location availability.